Graham cracker cups filled with a peanut butter cup, marshmallow and chocolate ganache. These Peanut Butter S’mores Cups are the perfect little seasonal delights! Welcome back to Day 2 of S’mores Week!! 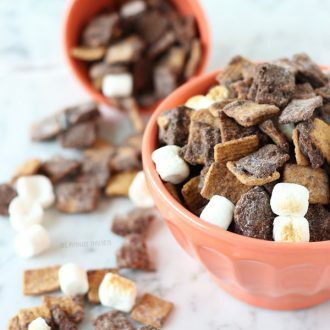 If you are just stopping by today, start with these Peanut Butter S’mores Muddy Buddies. There is something about summer that just screams s’mores. Technically you can make any of these s’mores inspired recipes year round but the warm, clear summer nights are just perfect for s’mores consumption making them the season’s greatest indulgence. 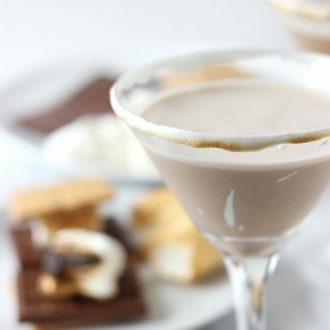 Today, I bring you another peanut butter s’mores concoction. I tell you my house is a PB and chocolate center 🙂 but I can’t complain when Mr J comes up with an idea as delicious as these for S’mores Week. These Peanut Butter S’mores Cups are the bomb!! Like seriously people. 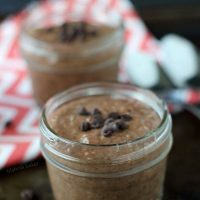 Super easy, super chocolate-y, super delicious. Wait, did I mention how easy they are to make? It’s like graham cracker crust (10 minutes bake to get that together) + peanut butter cup (totally go full size instead of mini) + huge marshmallow + chocolate drizzle easy! 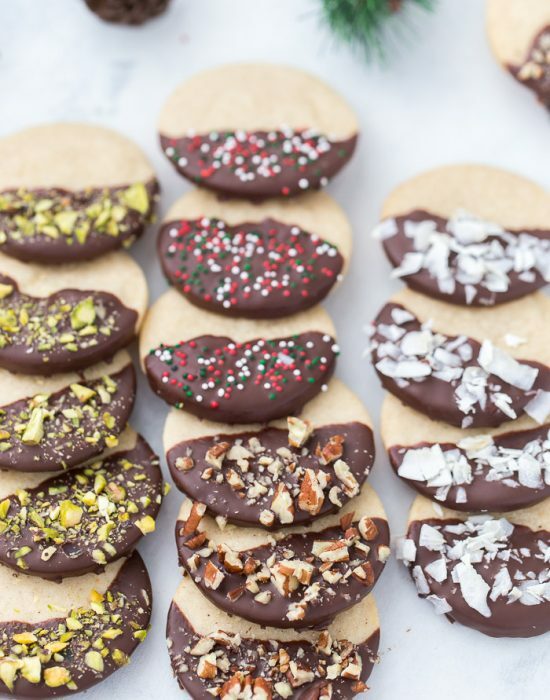 It takes all but 20 minutes to have these seasonal goodies in your hand to devour. Except….if you forget to spray your pan yo. I was baking these with my niece and we were having so much fun snacking on these muddy buddies that I did not remember to spray the muffin tins. Of course I had no idea until it was time to remove them from the pan and then I was like “Oh shoot, I didn’t use the PAM”. Who forgets to spray their pans? This girl!! 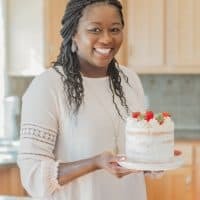 I almost didn’t share this recipe with you but I figured it was a great opportunity to share with you my secret weapon in the kitchen. PAM Baking Spray!! I cannot bake without it. My cake pans, bundt pans and cupcake tins (when I remember ahem) are always prepped with PAM baking spray before starting. 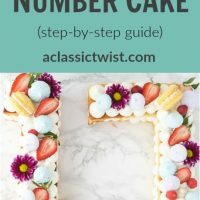 It makes everything release easily (watch that bundt cake leave no mess behind) and pretty much makes clean up easy. If I had sprayed these muffin tins before baking the graham cracker crusts, you would have seen unbroken cups here (as intended!). 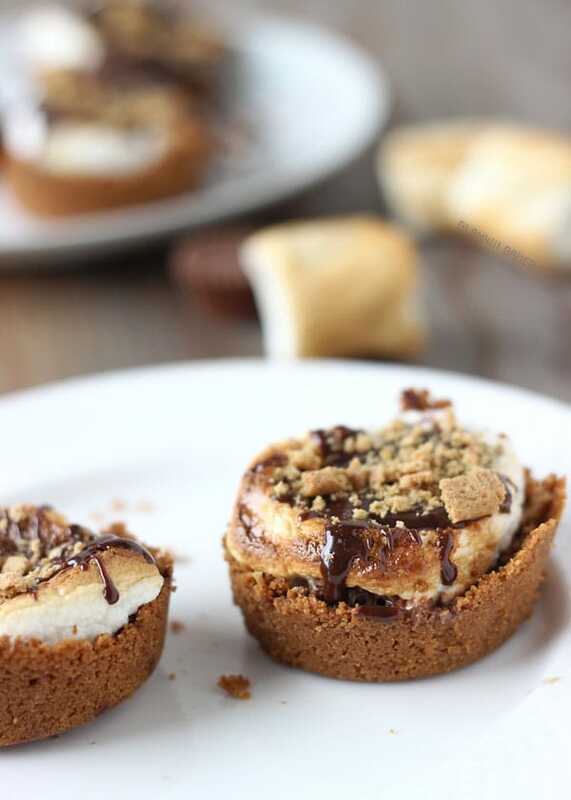 But now you can learn from my mistake when you make these PB s’mores cups! Graham cracker cups filled with a peanut butter cup, marshmallow and chocolate ganache. 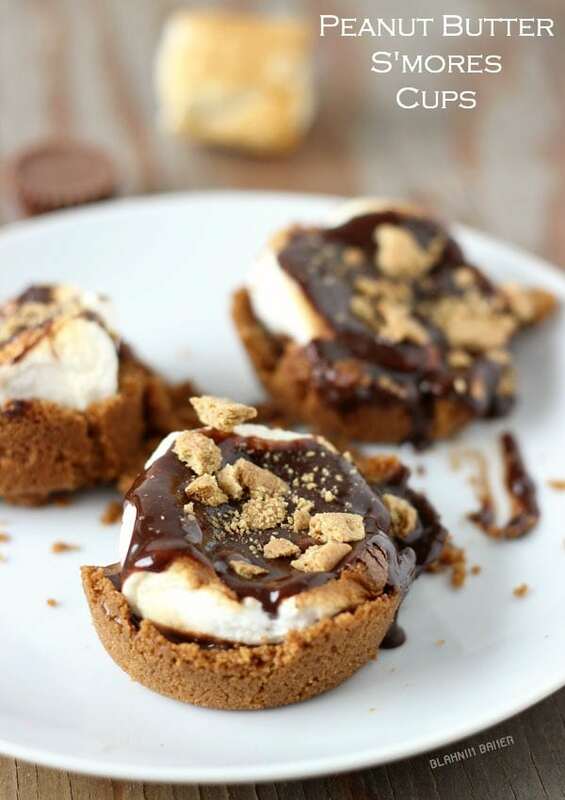 These Peanut Butter S'mores Cups are the perfect little seasonal delights! Preheat oven to 350 degrees F. Spray a regular size muffin tin with baking spray. Set aside. In a medium bowl, mix the graham cracker crumbs and sugar with melted butter. Press the crust into the prepared cups. Make sure you press the crumbs down and up the sides of the muffin cups. Bake until set, about 8-10 minutes. Let cool slightly. Place a peanut butter cup into each crust cup. Top each with a marshmallow. Brown marshmallows in oven for 1-2 minutes. Keep an eye on them so they don't burn. Once browned and slightly melting, remove from oven. Using a small spatula or dinner knife, remove individual cups from muffin tin. Place on serving plate. Top with chocolate ganache, fudge or syrup. Best enjoyed immediately! Store leftovers in an airtight container. Don’t forget to check out some of the other S’mores recipes by my blogger friends also celebrating S’mores Week! I love the simplicity of this recipe and the fantastic idea to add peanut butter cups, YUM! Yes! I love how you are incorporating peanut butter into all of your s’mores recipes! Yum! 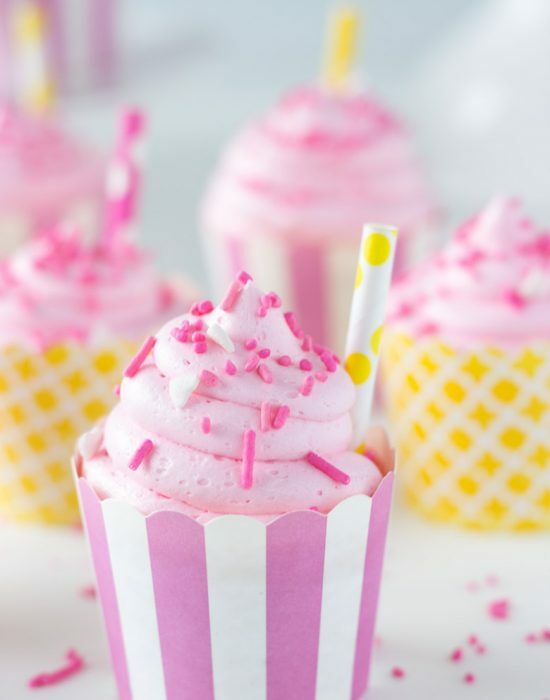 These look like the perfect dessert! And I love that you have links to all those other s’mores recipes! 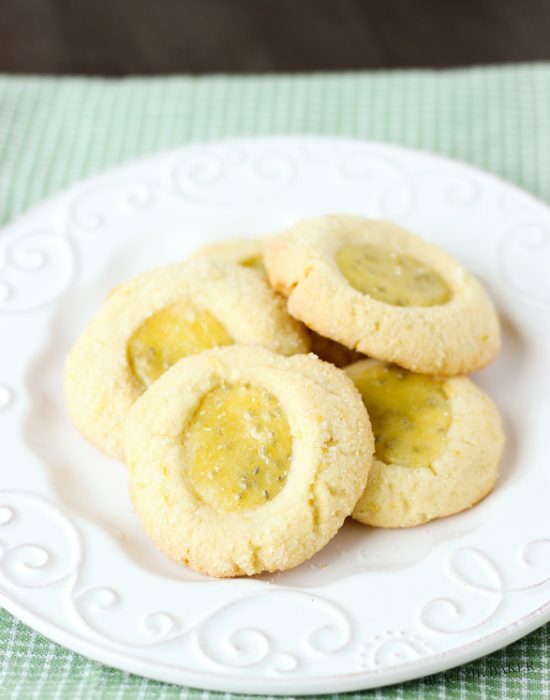 Pinned…can’t wait to try these! oh my gawd, Zainab!!! Girl, these are the ultimate!!! I love Reese’s Peanut Butter Cups. . and this is the ultimate indulge sweet treat. . LOVE this! Ohh this is the cutest dessert I’ve ever come across! I don’t think I’d be able to eat them – they’re soooooo darn cute *-* Oh well…. I think I might be able to 😉 They look yummy! I wouldn’t be able to stop eating these if they were in front of me. Love them!!! Who has marshmallow sauce still left in the fridge and is going to use it to top these instead of actual marshmallows?! THIS GIRL. The s’more PB combo is just genius! You have outdone yourself with this one Zainab! Lovin’ every bite. Pinned! OMG! OMG! OMG! I am so hungry and I have to make these this weekend. 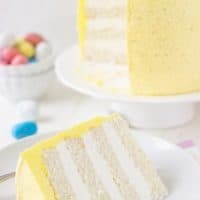 I am having some of my bridesmaids over and have been hunting for cute foods to make for them and these are going on the list. I LOVE YOU! I don’t even dare show my kiddoes pictures of this – as we would never leave the kitchen. Ermagawd, Zainab, I LOVE this amazing, simple yet ridiculously delicious S’mores recipe! Thank you for creating a quick way of getting this quintessential summer treat into my mouth. And the peanut butter twist is genius. Wow! Looks really good. S’mores are such a simple yet so addictive treat. Holy s’mores this looks insanely delicious girl! Love love love how simple and easy I can get my s’mores fix and that peanut butter cup inside is genius! To be honest, I think these somehow look more delicious with the Graham Cracker crusts just a little bit crumbly. What a delicious idea – but of course all of your ideas are delicious! Holy deliciousness, Batman! These look so tasty…and so easy. Nice work, Zainab! 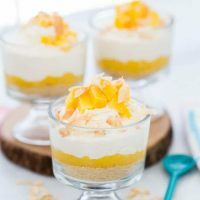 you always come up with such fun desserts! love this! I would never even have noticed…these look perfect to me! 😀 A little crumbly never hurt anyone. Peanut butter and s’mores is such a great combination! WHOA! These sound so delicious!! And they’re purrrrdy! I would eat the entire batch!! Thanks Kayle!! U do love your PB so I feel your pain lol! I thought these would be a cookie cup when I read the title. 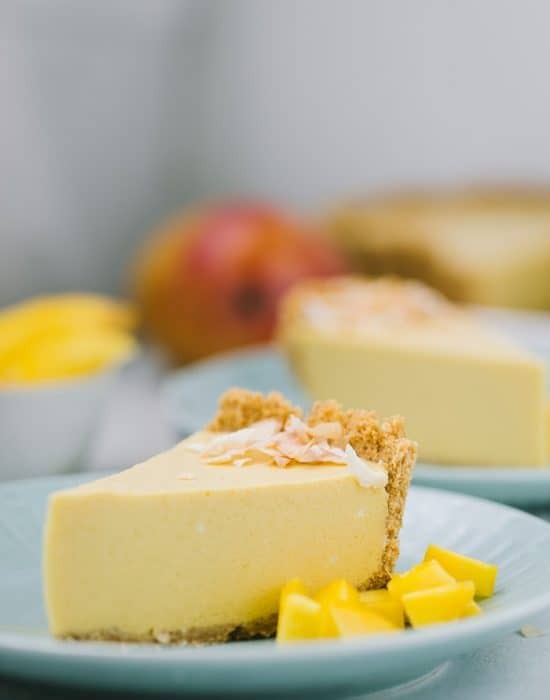 That graham cracker crust is so much better. 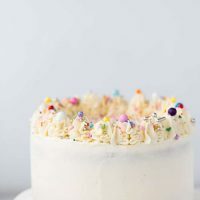 Easier and so much texture! I love graham cracker crust so I had to put it here!! 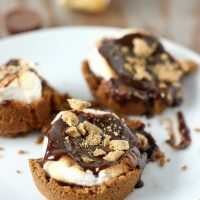 Ooo, I love the idea of yummy pb cups hiding inside yummy s’mores cups! Peanut butter mades everything better! Much better than a real s’more. Thanks for sharing!